2018 Bend Gallery Guides are available throughout Central Oregon in galleries, at Visit Bend and in tourism brochures racks. We invite you to enjoy Central Oregon’s rich artistic culture—visit our art galleries! Experience art in the Old Mill District, Downtown Bend and Second Street, during our monthly First Friday Gallery Walk, and visit us all throughout the month. Be sure to check-out the Old Ironworks District on Last Saturday. The First Friday Gallery Walk was created by the Bend Gallery Association over 20 years ago as a way to acquaint the community to the galleries. It has grown into a city-wide cultural event with many businesses joining in the fun. Galleries in downtown Bend and the Old Mill District kick-off their monthly shows on the First Friday of every month with an opening, inviting the public. Plan on making it a part of your monthly entertainment plan! 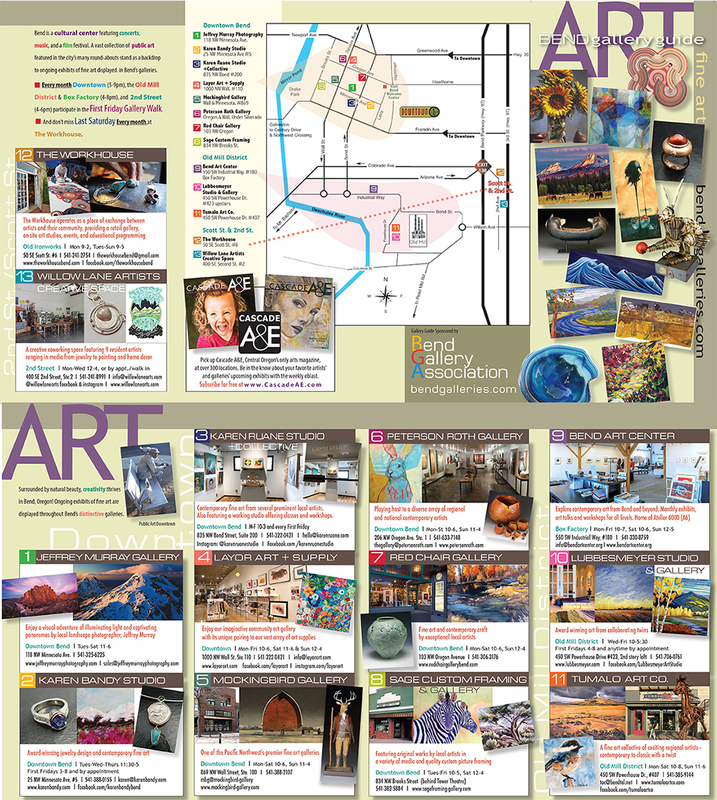 Pick up a Bend Gallery Association Gallery Guide at any gallery and in brochure racks throughout Central Oregon.